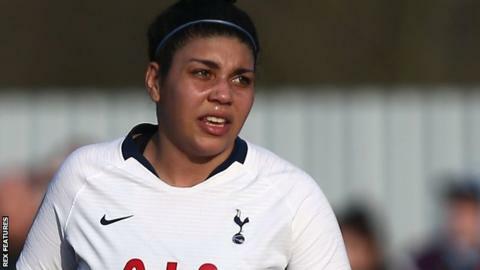 Tottenham Ladies defender Renee Hector has been "victimised" since reporting racial abuse against her in January, says Kick It Out's Troy Townsend. Sheffield United forward Sophie Jones was banned for five games on Wednesday after being found guilty of the offence during a Championship match. Hector claimed she "received some monkey noises" from an opponent. "Last night she received an image of a monkey on her social media account," Townsend told BBC Radio 4. "Sometimes I don't think we appreciate the wellbeing of someone who's done a brave thing." Jones, 27, whose Blades deal has been terminated by mutual consent, has said she is "not guilty" and the "hearing took place in a kangaroo court". She has also been fined £200, must attend an educational course and suggested in a statement that her football career is over altogether following the verdict. After Jones' punishment was announced, Hector said on Twitter: "There is no place for racism in our game. A zero-tolerance policy is imperative in stamping this out from football therefore I welcome this verdict. "No-one should be subjected to racist abuse on or off the pitch and I felt a responsibility to call it out for what it was." Speaking on The Today Programme, Townsend, equality campaign group Kick It Out's education manager, said: "When you're a victim you're victimised again because you do talk out. "Renee has been victimised about this ever since she spoke out about it on social media." The Football Association set up an independent panel to hear from both sides, with the charge of using abusive and/or insulting words - that included reference to ethnic origin and/or colour and/or race - found proven. An FA spokesperson said: "The case against Sophie Jones was heard by an Independent Regulatory Commission comprising two independent lawyers and a former football player and manager. "The written reasons in the case will be published in due course, which will provide a detailed account of the evidence given and the findings of the commission."